There's a sixth grader who frequents my school library (I'll call him Tim), checking out an astonishing number of books every day. In fact, in the past eight months, he'd checked out well over 200 books -- but every one of them was a graphic novel. Nothing wrong with that, but I occasionally wondered what it would take to get him to make the jump from visual to verbal narrative. 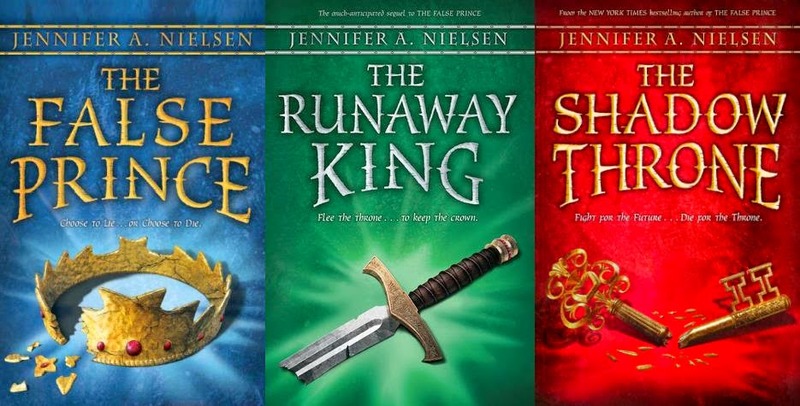 And then, in fourth quarter, he checked out The False Prince, the first book in the Ascendance trilogy by Jennifer A. Nielsen. A few days later Tim was practically jumping up and down at the circulation desk. "This book is SO COOL! The author, like, doesn't ever even let you know what's going on! I was completely tricked!" I can't continue quoting him without printing spoilers, but his excitement over this novel (completely devoid of illustrations though it was) was extraordinary -- and he desperately, desperately wanted the second book. Yesterday, when I asked him to pick out his favorite library books, he walked right past the graphic novel section and picked up the Ascendance trilogy. I don't think I have to tell any of GLW's readers what that felt like to me. Tim's love for these books is far from unique at our school. We brought in several copies of all three books in anticipation of the author visiting, and it quickly gained fans of every age, reading level, and gender -- including among the staff. As a school librarian I read a lot of YA books. Admittedly, sometimes reading some of these books feels more like work than pleasure. Reading the Ascendance trilogy, in contrast, was a very different and enjoyable experience. I found myself waiting for the next book in the installment every bit as eagerly as the kids. I won't go into a whole lot of detail about the first book, as it has been reviewed here by other readers before (last August and this April) but I will say this: if you're looking for a swashbuckling adventure story with a great balance of darkness and amusing moments, just a sprinkling of romance (not enough to make it mushy, but enough to keep it interesting), pirates, double-crosses, battles, clever capers, and a resolution that is neither too neat nor unsettling, then here you go. It's a series that I'd feel comfortable recommending to both fifth graders and ninth graders, and although the main character and most of the supporting cast are male, the strong female characters and great storytelling make it universally appealing. And of course, my reading experience was complemented by the awesome experience of getting to meet the author. I've always said that books have two creators -- the author and the reader -- but this has been my first chance to speak in person with that original creator. I look forward to sharing some of Jennifer A. Nielsen's thoughts from my interview tomorrow! I haven't yet gotten the last book, but SERIOUSLY, this series has been so great!! I love that you got someone to take the leap from graphics for them! I had students who faithfully stayed to How Stuff Works and Calvin & Hobbes - worthies, but I really wanted them to take the leap as well. Pottermania did it for them; if they were sixth graders now, I have a feeling these books might have done it for them too.